My after-market sewing goal was to make a quilt only from scraps. Sorting, measuring, pressing, and trimming my scraps is what took forever…the rest of it went together quickly. Sophie had rolls and cracks full of sand by the time we got home from the beach. When using a lot of different prints and colors, a simple pattern and a lot of solids makes it a bit easier on the eyes. It was fun to see what colors I use the most while sorting my scraps….red, green, blues, yellow, a little orange, and of course gray…SO much gray. This one measures 64″ x 80″. These blocks are simple to make and it’s a great way to use scraps. 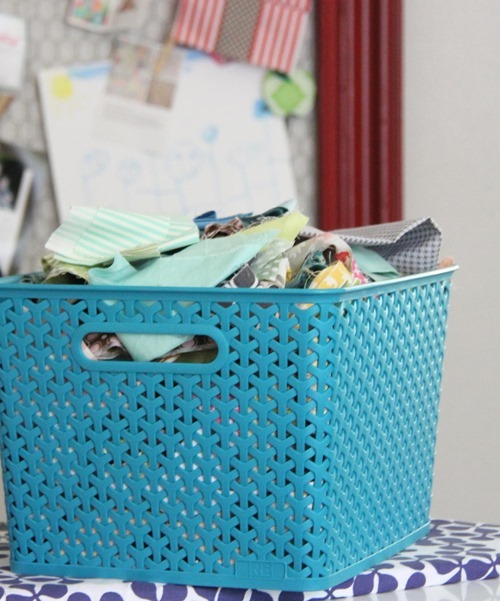 And of course…my scrap basket is still full, and ready for more. Edit: Thanks for the recommendations on good homes for scraps!! Jennifer, thanks for sharing that link. What an inspiring group! Allison, That's a lot of squares/scraps! I love the arrangement of color. I've been thinking about making an irish chain quilt with a scrappy background. Love the way yours looks. It's gorgeous! I can't wait for the mini tutorial. I see you already have several suggestions for charities. I'll wait and see if you need any more. Lovely quilt, the 4 little red blocks in a row really pop. I'm making a scrappy quilt for the pregnancy center I work at, if you wanted to contribute scraps to it! ;) But I see you have some great suggestions already. That looks great! I love scrappy quilts. I just made a mini quilt out of scraps, and each fabric reminds me of the project it came from. Actually, if you feel like a little field trip, we're having a sew-in on Vashon Island on the 15th. Allison, My quilt group here makes a quilt a month to donate to humanitarian services. We are ALWAYS needing fabric. Thanks. I second what Jacqueline said. I make more baby/childrens quilt so my scraps are not very "grown up" so to speak. As much as I would love to make a lap size scrappy quilt to have in our living room, I don't think rockets and teddy bears and police cars would fit the bill. lol Maybe you could put together a bag of scrappy goodness to give away or sell, and then have some to give to a charity. Love your scrappy quilt top. My scrap bin is about to take over my room, I need to do something! I love scrap quilts and this one is a definite beauty. Great job! I always have a basket of leaders and enders (a'la Bonnie Hunter) going for something. Then I can sew my twosies into foursies or into sixteen patches eventually. And WHERE was that picture taken? I couldn't tell from the sand if it was Vashon or Bainbridge or Whidbey or Bremerton or WHAT? This looks like my sort of quilt pattern, lots of straight lines and squares. Might have to try something like this. Thanks for the inspiration. Oh I love this! I sorted my scraps into buckets by colour at the beginning of the year because I started a 'fabric fast' – no new fabric for 2013. I'm really enjoying going there first and only using my stash when I need it for backing and binding. It's so satisfying! Love this quilt pattern and colors are awesome! Love it! Scrappy quilts are my favorite, because that is all my grandma used to make. Crazy, scrappy quilts are the best! Totally delightful! Your pix, with the baby in the background, are perfect. The solids do make a huge difference. Since I would like to cheat and have the scraps without doing all the actual sewing you need to do to accumulate them, I would say "Sell Them!" I have bought scrap bags from some online fabric stores, and it is fun to get a collection of fabrics that are new to you and that you maybe wouldn't necessarily choose for yourself. I like to use them to make zipper pouches and other small projects. It is absolutely beautiful! Love the photo of Sophie in the background playing on the beach. Have you ever heard of Mary Ellen Hopkins? When I first started quilting I saw a presentation by her and she described this exact block! I've always remembered it so it is fun to see you do it now. That's a very nice pattern, something relaxing to make without a lot of stress. Two of my grandchildren moved to Texas so I haven't felt like sewing too much. I think later this month I will start again. Thank you for the idea. I don't quilt. But somehow I came across this site while searching for crochet patterns. I am always truly amazed at the beautiful and creative things you post. I don't know how you find the time. I am always trying to squeeze my craft time in between 2 jobs and my little one are all big now. Thanks for sharing. Always an enjoyable visit. what a pretty, fun quilt. I hope to do one some day…. What a great pattern! It makes it possible to use all sizes of scraps! This might be my summer project. My goal is to spend an hour or so each week, using up my scraps. This would be perfect! Can't wait for the tutorial! 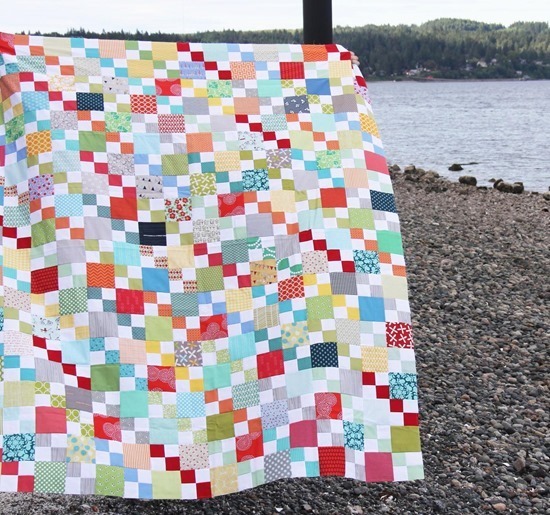 Love Love Love this scrap quilt! Of course that is mostly because I love the colors of your scraps :) Beautifully done. 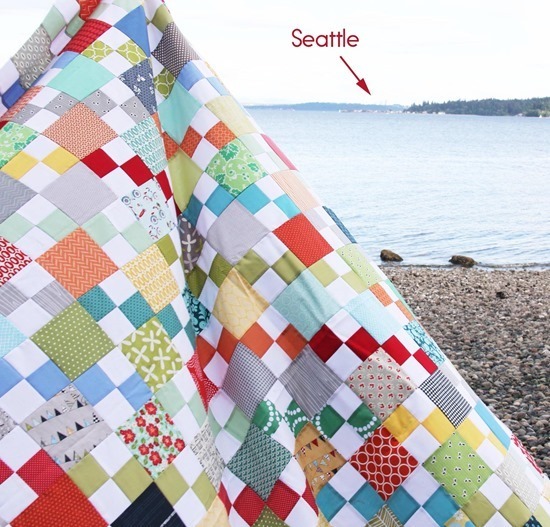 Your scrappy quilt top is wonderful! There is such a nice variety of fabrics in this quilt. I also loved where you photographed it. 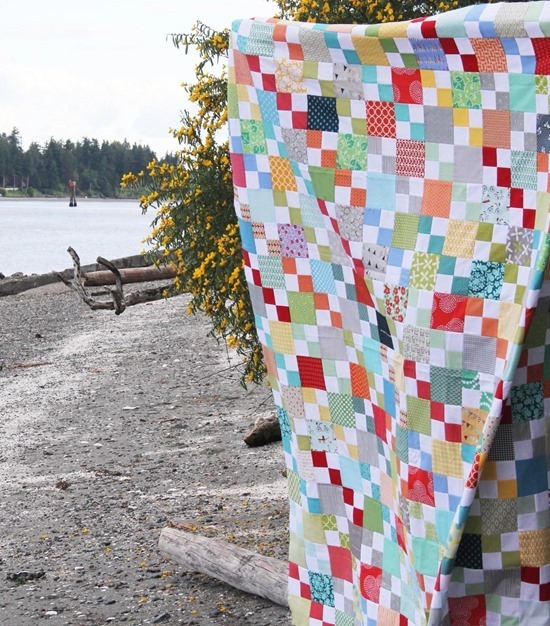 I live near lakes and the ocean so I now have a new plan to take pics of my quilts. Thanks for the idea! I, too, love your use of solids and near solids to keep the quilt from being overwhelming. It's the first scrappy quilt that I've really liked well enough to emulate. I'm thinking that the small four patches are made with 2-1/2" squares, which makes the bigger patch a 4-1/2" square, thus giving you an 8-1/2" block when sewn as your bottom blocks. Easy peasy and such a versatile pattern! 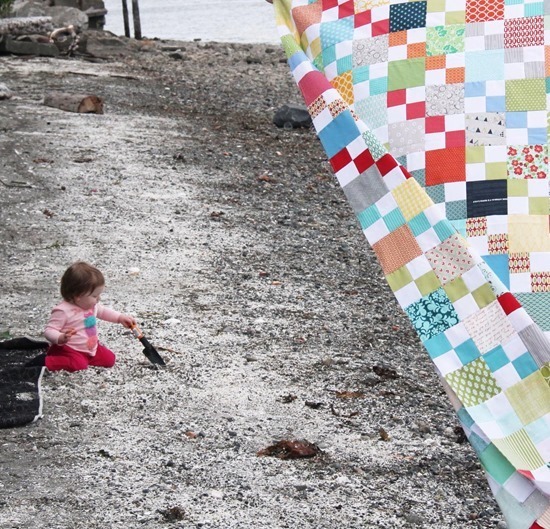 Love your scrappy quilt! Gives me inspiration to use my scraps!! Your daughter is adorable! An unanswerable question – Why is it that no matter how many scrap quilts I make, the amount of scraps never goes down? hmmm…. its a lovely quilt. I like the idea of using grey to calm it down. thanks. Oh, your scrappy quilt is lovely! I really need to get busy and pare down the scrap bin very soon. Scraps breeding the baskets Im sure. I donate small fabric scraps to my kids school and preschool. They use them at their making tables and activity boxes for when they are making things in technology and art. I love the satisfaction of using lots of scraps. Your quilt, as always, beautiful. This is a great idea. I'll have to borrow that one myself. I love this quilt, so beautiful! Absolutely love what you did with your scraps and your advice on solid colors. It's beautiful against the gray backdrop of the Seattle sky! Oh Imagine my surprise! I have been following you for a few years now and have been missing home a lot lately and I see this post, of the beach and Seattle! Thanks for this, I am currently in Dubai so am so home sick!